Parc y Meirw ( Field of the Dead) / A Stone Alignment . The stones are about 1km along the lane east of Llanllawer Church. The stones are incorporated into the bank between a large field , enclosed in the 19th century , and the lane. These mysterious alignments may be associated with ancestor worship , fertility cults , used as astonomical devices , for religious or ceremonial purposes - perhaps marking a processional route. 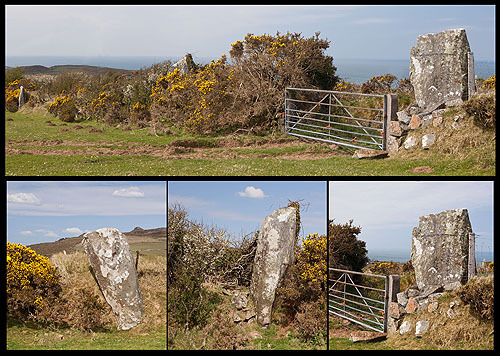 This Bronze Age site is the only known Stone Row in West Wales and of its eight or more stones, four are still standing , two being used as Gateposts . Also one large prostrate stone can be seen from the field , and another massive one from the lane . In folkore the name "Field of the Dead" may refer to an ancient Battle fought at this site.